4th Maxi-Cosi CabrioFix 105 | What Car? 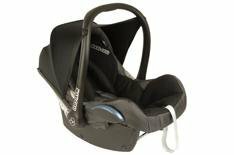 The CabrioFix comes with masses of cushions and padding to wrap up your baby in, while the straps also seem to be comfortable. Adjusting the carry-handle is a simple job, while the stow-away sun-shade hooks onto it to ensure it covers the seat well. The shade stores underneath the seat's plastic ridge above the baby's head, and can be a little difficult to fish out. Routing the seatbelt is child's play, because the lap section goes over the top of the seat through some ample guides. It's also easy to fix the buckles and tighten the straps, but they're a bit awkward to adjust as your child gets bigger and there are only two options. The CabrioFix comes with hooks for keeping the straps out of the way while you're putting your baby in the seat, which is a useful feature. You could sail past the 200 mark if you bought this seat with the ISOFIX base. Maxi-Cosi products are widely available online, however, so you could save yourself some cash this way. Most of the materials used in the Maxi-Cosi seat are good, but the sun-shade feels a bit fragile. The carry-handle also feels a touch cheap. There are two bases to choose from with the CabrioFix, and both are very good. The ISOFIX seat is simplicity itself and has plenty of indication to let you know that you've installed it correctly. The seatbelt base has a tensioning device and a leg that extends to the car floor to make sure the seat is secure.